Today I’m going to share a couple of FUN projects with you. 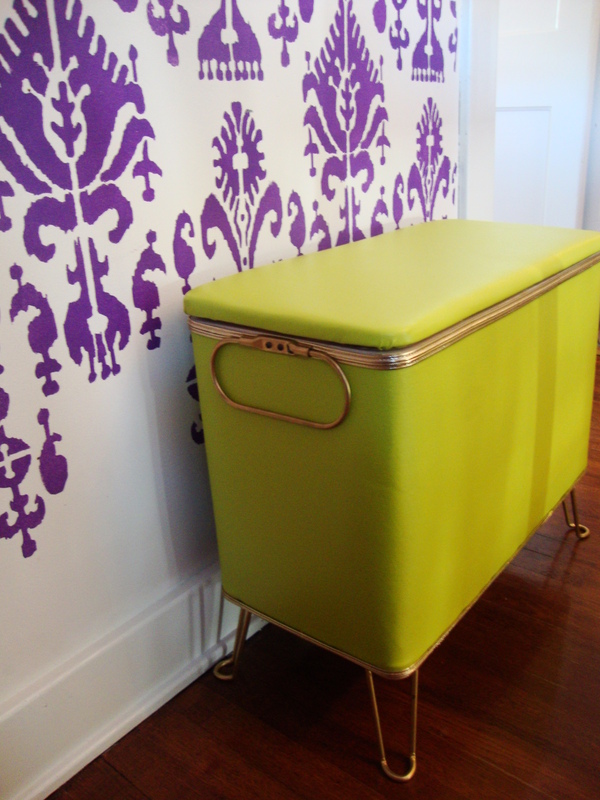 One is a vintage hamper that we found at our local Salvation Army for $12. I spotted it from across the room. It was one of those divine moments, the kind where everything around you is out of focus except one item which seems surrounded in a glowing orb of light. 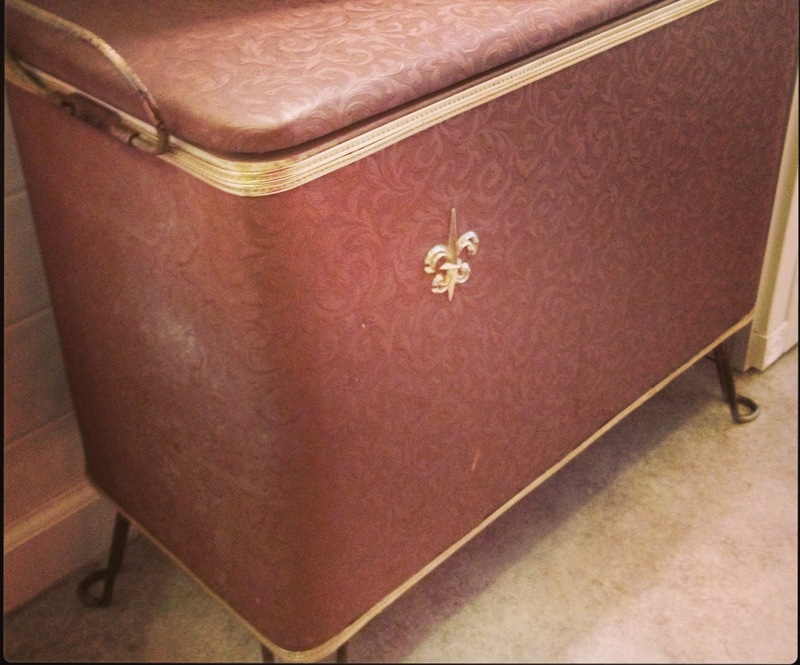 In this case it was a vintage hamper. It was the perfect size, in amazing condition, and had a style that makes me swoon. It.was.perfect. Except for the fact that it was horribly ugly. Good thing I love projects that require a trip to the fabric store! 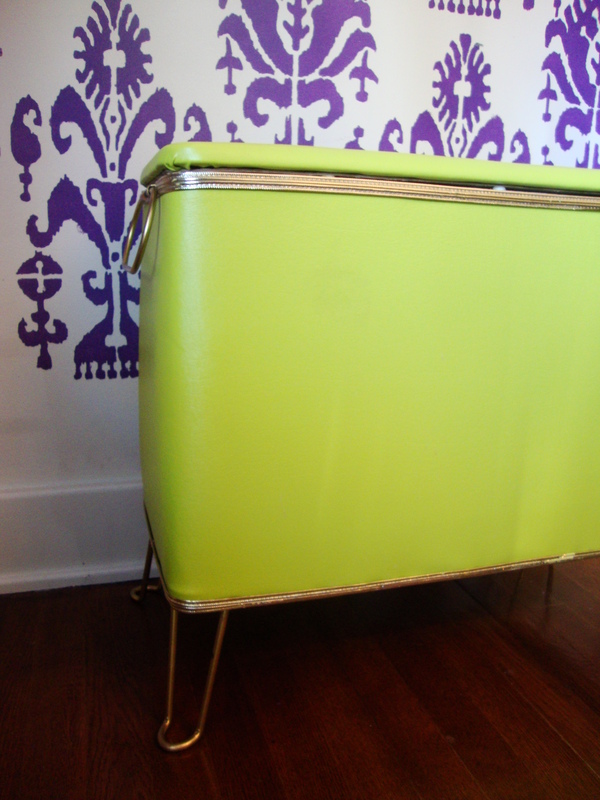 I scored a couple yards of lime green marine vinyl for less than $15. Then the Hubs began the painstaking process of disassembly. The handles and feet were removed, and all the old vinyl was removed and used as a template to cut the new vinyl. We scrubbed the hardware down with a wire brush to remove as much rust as possible, and then spray painted everything gold. 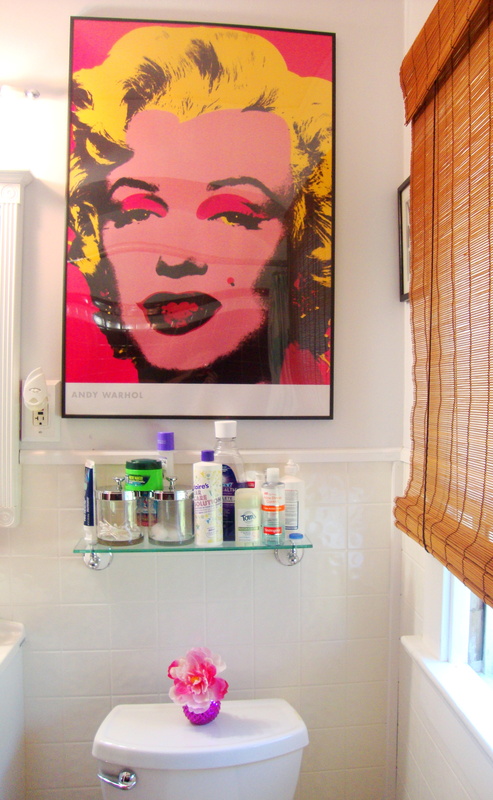 It’s even more fun paired with the ceiling fixture that we made from an old skirt! Say what? 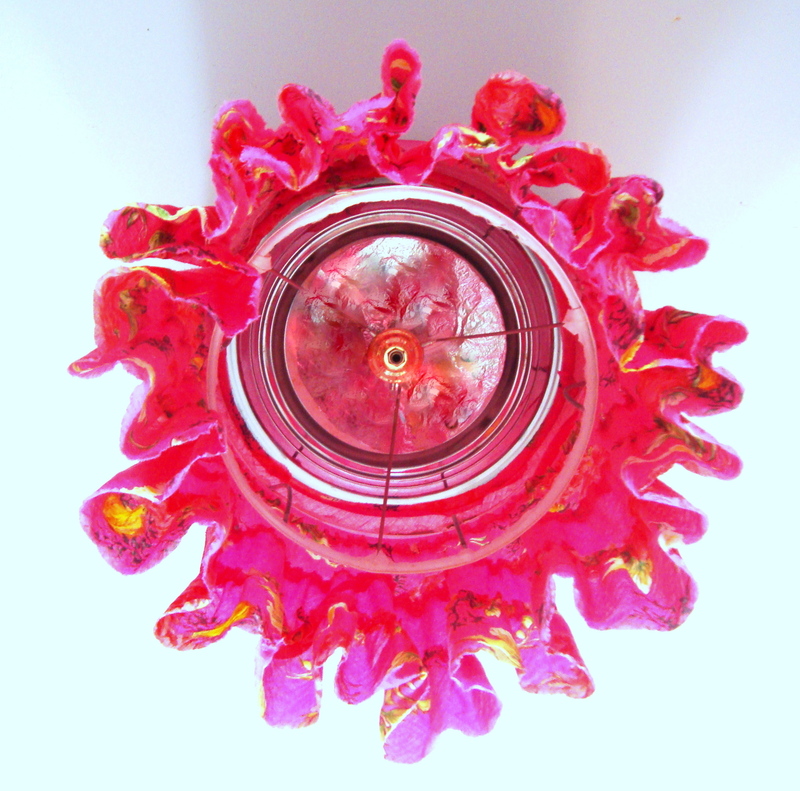 We originally had a generic dome type ceiling light in the bathroom, until that is, I had a light bulb moment (pun intended) to fashion this one made from an old pink hippy skirt. It literally took 5 mins to make. All we did was cut the bottom off of a ruffled skirt until it was the right length/size, and then we used Fabri-tac to glue part of it around the top of a lampshade. It is attached to the existing bolt of the fixture using the same cap that held the old one on. The bottom is open, exposing the light bulbs and underside of the fixture. I have plans to cover the bottom of the opening with another piece of fabric to hide all the ugly bits! I did manage to get a cool photo of the underside, and have included a few photos of the bathroom also so you can see the two pieces together in their natural habitat. That hamper is so cool 🙂 What a great and unique find! Thanks, Megan! 🙂 We are totally in love with it! Fantastic! 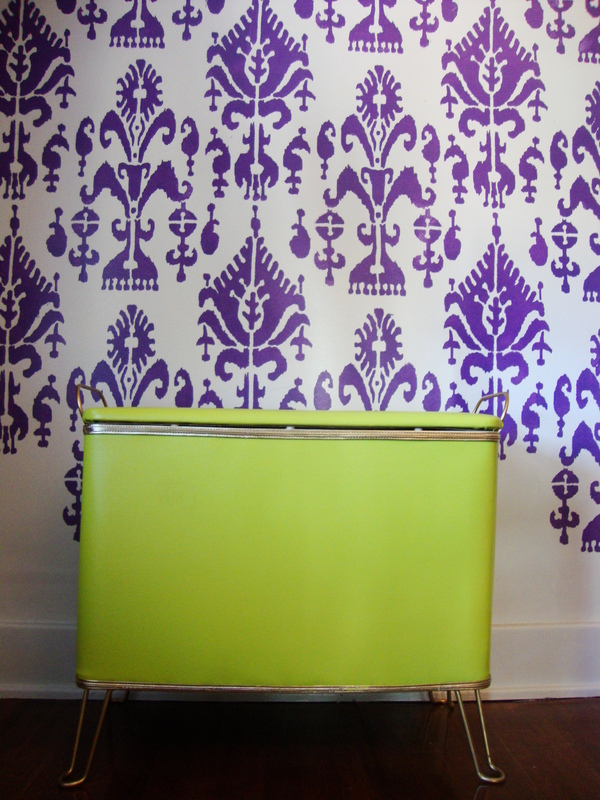 Looks like it really works well with that bold wall pattern, and great find on that marine vinyl!